The Point Neighborhood is a culturally diverse neighborhood and since the turn of the early 1900's has been a gateway neighborhood for new immigrants, initially a large French population who worked at the factories in the Shetland Park area. This has changed in the mid 70's to an increasing Latino population and continues to be predominantly populated by a large Latino community and others with a below median income. There are a number of new immigrants where there are language barriers. Since mid-summer last year there have been a few concerning incidents including a shooting in the middle of the street with no one injured, a shooting which targeted someone, but no injury, and a shooting that resulted in a fatality a couple months ago. These have all occurred on or near Salem Street which is not in the block of the complainant. Then there was a shooting incident in another neighborhood adjacent to The Point Neighborhood, which narrowly missed one of the officers when they attempted to arrest this person on warrants. Salem Police obtained a search warrant and arrested 3 persons on drug dealing and retrieved the gun believed to be involved in the first shooting. They responded to a call for service and recovered another gun and charged someone believed to be involved in the second incident. They identified and arrested the suspect in the fatal shooting and the arrested the suspect in the officer near miss shooting and recovered that weapon. What all had in common was a link to a group involved in drug dealing by parties who recently relocated to Salem from the Boston area. 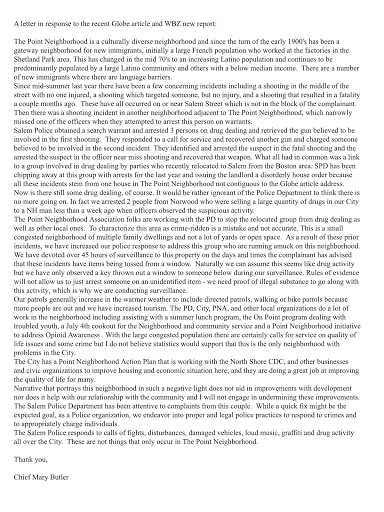 SPD has been chipping away at this group with arrests for the last year and issuing the landlord a disorderly house order because all these incidents stem from one house in The Point Neighborhood not contiguous to the Globe article address. Now is there still some drug dealing, of course. It would be rather ignorant of the Police Department to think there is no more going on. In fact we arrested 2 people from Norwood who were selling a large quantity of drugs in our City to a NH man less than a week ago when officers observed the suspicious activity. The Point Neighborhood Association folks are working with the PD to stop the relocated group from drug dealing as well as other local ones. To characterize this area as crime-ridden is a mistake and not accurate. This is a small congested neighborhood of multiple family dwellings and not a lot of yards or open space. As a result of these prior incidents, we have increased our police response to address this group who are running amuck on this neighborhood. We have devoted over 45 hours of surveillance to this property on the days and times the complainant has advised that these incidents have items being tossed from a window. Naturally we can assume this seems like drug activity but we have only observed a key thrown out a window to someone below during our surveillance. Rules of evidence will not allow us to just arrest someone on an unidentified item - we need proof of illegal substance to go along with this activity, which is why we are conducting surveillance. Our patrols generally increase in the warmer weather to include directed patrols, walking or bike patrols because more people are out and we have increased tourism. The PD, City, PNA, and other local organizations do a lot of work in the neighborhood including assisting with a summer lunch program, the On Point program dealing with troubled youth, a July 4th cookout for the Neighborhood and community service and a Point Neighborhood initiative to address Opioid Awareness . With the large congested population there are certainly calls for service on quality of life issues and some crime but I do not believe statistics would support that this is the only neighborhood with problems in the City. The City has a Point Neighborhood Action Plan that is working with the North Shore CDC, and other businesses and civic organizations to improve housing and economic situation here; and they are doing a great job at improving the quality of life for many. Narrative that portrays this neighborhood in such a negative light does not aid in improvements with development nor does it help with our relationship with the community and I will not engage in undermining these improvements. The Salem Police Department has been attentive to complaints from this couple. While a quick fix might be the expected goal, as a Police organization, we endeavor into proper and legal police practices to respond to crimes and to appropriately charge individuals.